Measles deaths have fallen by 60% worldwide since 1999 -- a major public health success. This exceeds the United Nations goal to halve measles deaths between 1999 and 2005 and is largely due to an unprecedented decline in measles deaths in the African region. The progress was announced today by partners in the Measles Initiative: the American Red Cross, the United States Centers for Disease Control and Prevention (CDC), the United Nations Foundation, UNICEF and the World Health Organization (WHO). According to new data from WHO, global measles deaths fell from an estimated 873 000 deaths in 1999 to 345 000 in 2005. In Africa, the progress has been even greater, with measles deaths falling by 75%, from an estimated 506 000 to 126 000. The data will be published in this week's edition of The Lancet. "This is an historic victory for global public health, for the power of partnership and for commitment by countries to fight a terrible disease," said Dr Margaret Chan, WHO Director-General. "Our promise to cut measles deaths by half and save hundreds of thousands of lives has not only been fulfilled, it has been surpassed in just six years with Africa leading the way." The 75% reduction in measles deaths in Africa is due to the firm commitment and resources of national governments, and support from the Measles Initiative. It is described as "a spectacular achievement," by Mr U Olanguena Awono, Minister of Public Health, Cameroon. "We are winning the fight against measles, which has long killed, sickened and disabled our children. Our determination is stronger than ever to make measles history by further strengthening our measles control activities, working in concert with our international partners and setting aside resources." enhanced care, including the provision of supplemental vitamin A. As a result of this strategy, between 1999 and 2005 global measles immunization coverage with the first routine dose increased from 71% to 77%, and more than 360 million children aged nine months to 15 years received measles vaccine through immunization campaigns. "One of the clearest messages from this achievement is that with the right strategies and a strong partnership of committed governments and organizations, you can rapidly reduce child deaths in developing countries," said Dr Julie Gerberding, Director, United States Centers for Disease Control and Prevention (CDC). Accelerated measles control activities are contributing to the development of health infrastructure to support routine immunization and other health services through promotion of safe injection practices, increased 'cold chain' capacity for vaccines storage, and the development of a global public health laboratory network. In addition, measles vaccination campaigns are contributing to the reduction of child deaths from other causes. They have become a channel for the delivery of other life-saving interventions, such as bednets to protect against malaria, de-worming medicine and vitamin A supplements. Combining measles immunization with other health interventions is a contribution to the achievement of Millennium Development Goal Number 4: a two thirds reduction in child deaths between 1990 and 2015. "Reducing measles deaths by 60% in just six years is an incredible achievement," said UNICEF Executive Director, Ann M. Veneman. 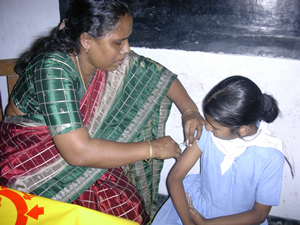 "Immunizing children is clearly saving lives and contributing to the achievement of the Millennium Development Goals. We must urgently build on this momentum with integrated community-based health programmes to help save the lives of more than 10 million children who die of preventable causes every year." There is still some way to go in the fight against one of the world's most contagious diseases. Of the estimated 345 000 measles deaths in 2005, 90% were among children under the age of five -- many dying as a result of complications related to severe diarrhoea, pneumonia and encephalitis. The challenge now is to reach a new global goal: the reduction of global measles deaths by 90% by 2010, compared to 2000 levels. This means that the gains made in countries that have implemented accelerated measles control strategies must be sustained, and similar strategies must be implemented in countries with high numbers of measles deaths, such as India and Pakistan. "How could we deny the gift -- and the right -- of growing up to millions of children?" said Bonnie McElveen-Hunter, Chairman of the American Red Cross. "Today, more than 100 000 Red Cross Movement volunteers are delivering that gift in Africa alone. Thanks to the great generosity and dedication of our donors and partners, entire communities have been reached with life-saving health information, saved from the pain of measles by neighbours who care enough to encourage them to get vaccinated. We see children in America willing to share their allowance money with their unseen neighbours in Africa, neighbours they will never know. The American Red Cross is proud to be part of a mission where so many young lives have been saved ... and we look forward to helping save millions more." "The success of the Measles Initiative has added to the confidence of national governments and donor partners to undertake public-private partnerships to make a significant impact on disease prevention," said Kathy Bushkin Calvin, Executive Vice President and Chief Operating Officer of the United Nations Foundation. "Collaboration at every level, including shared decision-making and therefore shared responsibility among all partners, has strengthened and enhanced each partner's contribution while increasing the impact on mortality reduction." Note: This article has been adapted from a news release issued by World Health Organization.